Oxford dictionary literally defines unity as a situation in which a group of people or countries work together for a particular purpose. In a simple understanding, unity is not a process or a planned situation; it is an existing sequence. PMB just stated that the unity of Nigeria is not negotiable. Which unity was he really talking about? Who are behind this very UNITY? President Mohammadu Buhari, fondly called GMB General Mohammadu Buhari or PMB President Mohammadu Buhari as the case maybe, is the president of the Federal Republic of Nigeria and the grand commander of all the Nigerian forces by the virtue of the office of the presidency. As the president of the Federal Republic of Nigeria, he swore to never allow any serving public servant travel abroad for medical treatment, but the same Mr. Buhari stayed in London for over 104 days for medical tourism. 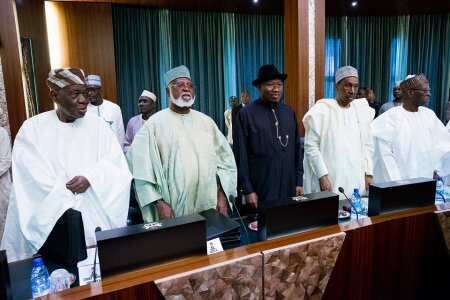 The constitution of Nigeria stipulates that when a president is away for more 90 days, the Federal Executive Council FEC should declare such president incapacitated and the Senate should impeach such president but the pot bellies in the Red chamber decided to maintain the philosophy of "don't talk while eating" this philosophy has been existing since the inception of Nigeria. President Mohammadu Buhari came back to Nigeria on the 20th of August, 2017 after spending not less than 104 days away from his home country. Mr. Buhari decided to address Nigerians on the 26th of August, 2017. In Mr. Buhari's coup d’état like speech/military announcement, he addressed the Biafrans as "irresponsible elements", he also addressed us as "Terrorists and criminals that we must be fought and DESTROYED". In General Mohammadu Buhari's coup like speech, he hinted mostly that the unity or union of Nigeria is not negotiable whilst stressing that "NIGERIA'S UNITY IS SETTLED"
Responding to Mr. Buhari's speech, I will liken it to a union (marriage) between a man and a woman, (I will use Mr. Buhari's first marriage to his legally married wife, Safinatu Yusuf as a case study). Safinatu Yusuf was Mr. Buhari's first wife but Mr. Buhari divorced her when he found out that the marriage was not meant to be. Comparing Mr. and Mrs. Buhari's marriage to their later divorce, to Nigeria's unity or union, I humbly ask Mr. Buhari "why he divorced his first wife Safinatu Yusuf?" Gen. Mohammadu Buhari, the unity of Nigeria is very negotiable; to be optimistic, the unity of any country on this earth is highly negotiable. Nigeria is not a secret union or a cult group where members aren't allowed to quit when they misplace their interests. Just like Mr. Muhammadu Buhari married Safinatu Yusuf in 1971; and divorced her in1988 as a result that it’s not working, Biafrans are tired and determined to divorce, we are tired of it, and it isn't working for us too. Mr. Buhari, in your speech, you said you met with Gen. Ojukwu and both of you discussed the unity of Nigeria and came to a conclusion that the unity of Nigeria is not negotiable. Let me just agree that the said meeting took place, even though there was no evidence of the said meeting. Buhari, how is it that the outcome of this said meeting is now binding on the whole country (even the Odua people that are the Yoruba people). Mr. Buhari, how does this meeting address the yearning and aspiration of the different regions in Nigeria? Mr. Buhari, does this unproved meeting means that the Biafran agitation is illegal? It is even highly unbelievable and inconceivable that Gen. Dim Ojukwu (the supreme leader of Biafrans) would have agreed with you Gen. Buhari that the unity of Nigeria is not negotiable. Would Gen. Dim Ojukwu not have given conditions for the country to remain as one? He wouldn't have just acrimoniously bound us together with these northern blood sucking demons and parasites per say. During Gen. Mohammadu Buhari's coup d’état like speech (more like an announcement), he discussed Gen. Dim Ojukwu in "great depth" stressing that he and Ojukwu "analyzed the problems of Nigeria". Now, I do not doubt Gen Mohammadu Buhari's words, but I am highly surprised that Gen. Mohammadu Buhari emphatically told us the outcome or conclusion of this meeting without finding it worthy to tell the whole world the basis of the conclusion or the implicit or explicit premises for this conclusion. This is pathetic, an outright lie from the president of Nigeria, "His Excellence" President Mohammadu Buhari (Mr. Integrity). Hello, Mr. President, the only way, I repeat, the one and the only way to remain a "United Nation" anywhere on this earth is by continuous negotiations and renegotiations of the terms of "Nationhood". Nigeria has continued to ignore this singular fact; they are highly compromising this fact. In 1967, we delegated Gen. Dim Ojukwu to negotiate with Nigeria in Aburi (a town in Ghana) about the unity of this entity. We made a deal with Nigeria (ABURI ACCORD), the deal/agreement was RESTRUCTURING. (Aburi was for restructuring of Nigeria). The restructuring was to be based on the "Re-organization of the Armed Forces", "Constitutional Arrangement", and "The issue of displaced persons within Nigeria. "None of these agreements were ever implemented even up till date, yet they are shouting "RESTRUCTURING," "RESTRUCTURING". We are now Biafrans and we are now asking for a referendum, if we lose in the referendum, we will keep quiet about Biafra and freedom just like the Scottish did when they lost the referendum given to them by the British government. Fellow countrymen and women, on referendum we stand. There is no room for compromise. NO REFERENDUM, NO ELECTION.